Pretty Bird African Species Bird Food 20lb Designed specifically for African species and medium to large conures, Pretty Bird's African species bird food contains higher calcium. Also contains 14% protein and 8% fat in medium sized morsels, perfect for this species. 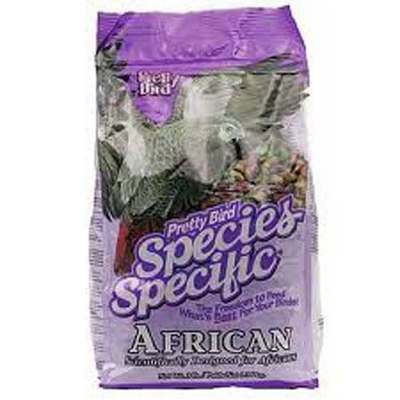 Features: Complete and balanced meal for African parrots and conures Bright, fruit-like colors and shapes give your bird the feeling of variety while offering the same balanced nutrition in every morsel Contains vitamins, minerals, amino acids, and fatty acids that this species needs for optimum health Item Specifications: Size: 20lb Ingredients: Corn, Oats, Corn Gluten Meal, Wheat, Potato Protein, Soya Oil, Coconut Oil, Calcium Carbonate, Dicalcium Phosphate, L-Lysine, Choline Chloride, Natural and Artificial Flavors, DL Methionine, Isoleucine, L-Threonine, L-Tryptophan, Vitamin E Supplement, Ascorbic Acid (Vitamin C), Ferrous Sulfate, D-Biotin, Yucca Schidigera Extract, Zinc Oxide, Manganous Oxide, Niacinamide, Magnesium Oxide,Vitamin B12 Supplement, BHT ( as a preservative), Copper Sulfate, Calcium Iodate, Calcium Pantothenate, Vitamin A Supplement, Sodium Selenite, Folic Acid, Riboflavin, Pyridoxine Hydrochloride, Thiamine Mononitrate, Natural and Artificial Colors, Menadione Dimethylpyrimidinol Bisulfite (source of Vitamin K3), Vitamin D3 Supplement, Cobalt Sulfate.